The Dinghui Monastery of Yangzhou knows how to braise wood ear until they double their thickness and braise shitake until they triple in thickness.1 Prepare a mushroom broth first to use as the cooking liquid in this recipe. 1Extra thick and extra big? Whenever I hear about how well someone is about to reconstitute some dried food item, a process which is referred in Chinese cuisine as fa (發), I can’t help but think they added something to the soaking liquid. One of the more popular agent’s used for “Fa”-ing meats and dried foods in modern Chinese cuisine is baking soda. A tiny pinch in chicken makes it tender and gives the meat a slight “bounce”, too much gives everything an odd flavour and texture. I’ve had chicken that is so over “fa”-ed that it has the texture of fish. Perhaps the monastery has added something to make their reconstituted wood ears and shitake so thick? This recipe “imitates” the pheasant recipe later in the chapter, where the meat is seasoned, wrapped in caul fat, and fried. It is in-turn remarkably similar to a modern Taiwanese dish known as chicken roll (雞卷), where a mixture of ground pork, onion, and egg is wrapped inside tofu skin. Although the ingredients for the three dishes are somewhat different, one sees from the similarity in their textures and their names that they are in fact variants of one another. Their fillings: the ground pork and egg mixture, the chicken breast and egg mixture, and the pheasant, all cook to similar textures and consistency. Their wrappings or tofu skin or caul fat all fries up crisp and has a “snap” when you bite into them. Looking at these recipes together and identify their similarity and differences is quite like tracing back a family’s lineage or looking back in the fossil record, to identify an individual’s ancestors. Together, I see the changes across time of these three dishes as evolution in action. Another method is to first take a jin of pork, one qian of sugar, half a jin of wine, one jin of water, and a half tea-cup of light soy sauce. Boil the meat first in the wine for ten to twenty gun  then add the rest of the ingredients along with one qian of fennel seeds. Continue simmering the meat until soft while reducing the cooking liquid to the desire richness. This preparation is also very good. : Unlike its better-known relative Red-cooked/braised pork, one rarely sees white-braised pork in modern Chinese cuisine. In fact, a quick google search reveals that most references to the term (白煨肉) is associated with the Suiyuan Shidan. The closest example to white-braised pork that I can think of is the classical preparation of Taiwanese pork hock noodles（猪脚麵線) that uses little to no soy-sauce. The cuilinary trend, sadly, seems to be towards the use of more and more soy-sauce to the point that now the noodles have now split into “clear-cooked” (清燉) and “red-cooked” variants (紅燒), where the meat is cooked with salt or soy-sauce, respectively. Maybe this is just the more “global” shift in Chinese cooking, where people just tend to go more towards the darker soy-sauced/richly flavour items more than the simply flavoured stuff. For instance, the term lu (滷) was used exclusively to describe brine, but is now so commonly used in describing soy-sauce based braising that its original meaning had largely changed. Use the terms lu shui (滷水), lu wei （滷味）, and indeed， lu， is now all about the soy-based stewing liquid, items cooked in said liquid, and the cooking technique using the liquid, respectively. : Here we go with this gun (滾) business again. In Pork 1: Pig’s Head, I’ve sorta decided it’s 3 seconds/滾 which makes 10-20 gun around 30-60 seconds. This step sounds like boiling off the alcohol. As an ingredient, sea cucumbers have little to no taste, are full of sand, and are remarkably fishy in smell. For these reasons, it is also the most difficult ingredient to prepare well. Due to its heavy and thick texture, sea cucumbers should never be cooked in mild and delicate soups. For the small spiked sea cucumber , one must first soak it in water  and remove all the mud and sand embedded in the item. It must then be boiled three times in meat broth and then simmered in chicken and pork extracts with soy sauce until supple and soft. 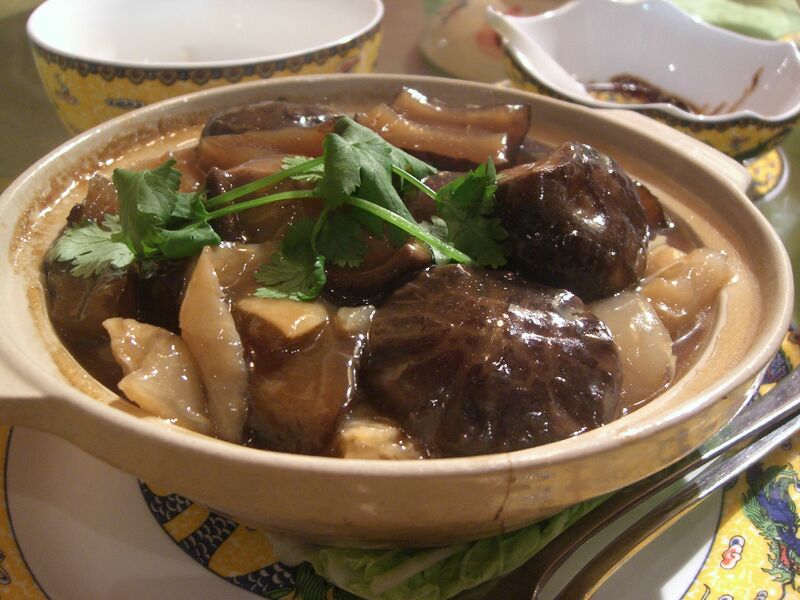 One should use shitake or wood-ear mushrooms  as supporting ingredients to sea cucumber since their colours match well. If one is entertaining guests the next day, preparations for the sea cucumbers must be started immediately since it needs to be simmered for an entire day in order for it to be soft enough to eat. In the summer, Observer Qian’s abode serves an exceptionally good salad of shredded sea cucumber tossed with a ground mustard and chicken extract dressing, or soups of finely cubed sea cucumber with cubed bamboo shoots and cubed shitake mushrooms in chicken broth. In the abode of Assistant Minister Jiang  they serve a dish made with simmered tofu sheets, chicken thighs, and mushrooms with sea cucumbers that is also very good. : Apostichopus japonicus. These are popular for individual servings due to their smaller size. But for more gourmets, Holothuria fuscogilva, known as the “white teatfish”, is more alluring due to the thickness of its gelatinous flesh. The thickness criteria for quality extends to squid and cuttlefish. There is nothing better than biting into thick slice of fresh grilled squid simply seasoned with olive oil and salt, like they do in Valencia, Spain. : Sea cucumbers, the “Ginseng of the oceans” (海參), are almost never sold fresh and any “fresh” sea cucumbers should be suspect. When dried they are hard as a rock and a bit heavy for its size. Check-out this site for pictures. Yes, by many people’s standards they look far from appetizing, but note too that by many people’s standards a moldy spoiled chunk of coagulated milk is also rather disgusting. : Shitake and woodear. Delicious. : For a while I had no idea what was “錢觀察家”. Roughly translated it means: “Person/family in a profession that watches money”. Accountant? Money handler? Treasurer? Financier? Little did it occur to me tha perhaps “錢” could have been a last name. So, 錢觀察家 should actually be translated as “Observer Qian’s abode”. Go figure.